Sources say in order to make the trade work after July 10 — when the league’s annual moratorium is lifted — the Knicks will have to sign-and-trade at least one player they had at the end of the season as part of the deal. Earl Barron and Quentin Richardson are possibilities, according to sources. Kenyon Martin, however, is not going to sign off on being signed-and-traded to Toronto, sources say. The New York Times earlier reported the development, and the newspaper also mentioned the trade would involve the Knicks giving up their first-round pick in 2016. Bargnani is represented by Leon Rose, whose clients include the Knicks’ Carmelo Anthony andJ.R. Smith. In addition, Knicks general manager Glen Grunwald is the former GM of the Raptors, the team that drafted Camby with the second overall pick in 1996. Camby did not sound enthused about potentially heading back to Toronto. “It’s unfortunate that I wasn’t given a meaningful opportunity to contribute last season in New York. I was really looking forward to the upcoming year as a chance to show the organization what they missed out on last year, and pushing our team towards the Finals,” he said in a statement through his agent. The trade would appear to put the Knicks — already over the luxury-tax threshold — in further short-term financial duress. Camby and Novak’s salaries total about $8.7 million for next season, while Bargnani, 27, is due to make $23 million in the next two seasons. If the trade goes through, he’ll also receive a $500,000 bonus as part of a trade kicker. In addition, Bargnani, the No. 1 pick in the 2006 draft, has missed 98 games in the past two seasons due to injuries. Last season he was sidelined in early March because of an avulsion sprain in his right elbow. But Bargnani’s contract will have expired entering the 2014-15 season, giving the Knicks the prospect of cap flexibility in 2015, when the salaries of Anthony, Amar’e Stoudemire and Tyson Chandler come off the books. Trading for Bargnani is also viewed as potential insurance if Smith decides to bolt in free agency. A few teams, including the Detroit Pistons, Milwaukee Bucks and Phoenix Suns, are preparing to make higher offers than the Knicks to sign the Sixth Man Award winner. The Knicks can only offer $5.58 million with “early Bird rights” but they still feel like they have the upper hand. In fact, Smith has agreed, along with his family, to first meet with Knicks coach Mike Woodson and the team’s front office on Sunday night to discuss his future in New York. 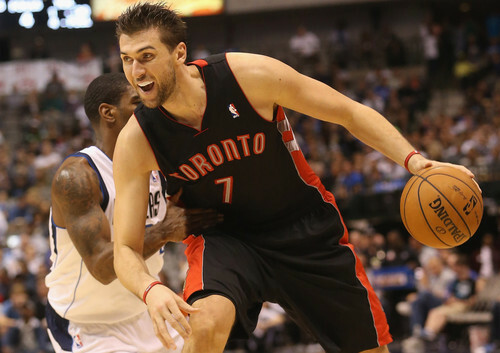 It’s unclear how Bargnani’s role would affect Stoudemire’s. But the move would appear to represent the Knicks’ focus on contending for an NBA championship by 2015 and putting pressure on the Brooklyn Nets after their Atlantic Division rival’s additions of Kevin Garnett, Paul Pierce and Jason Terry. A league source said the Knicks could also pursue point guard Aaron Brooks, who was recently waived by the Houston Rockets. Rose, who also represents Brooks, told ESPNNewYork.com earlier this month that Brooks would be a “good fit” in New York with his transition game and 3-point shooting, which figure to be two keys in the Knicks’ offense next season. The Knicks have been interested in Brooks in the past, and securing a backup point guard this offseason is a priority. They would also like to re-sign Pablo Prigioni, but he has given them no indications whether he’ll return to New York or head back to Spain, where he played professionally for many years.